JD Draper entered the world of franchising in 1971, as a Burger King franchisee. As his career progressed, eventually becoming the president of operations at V&J Holdings (a Burger King, Auntie Anne's and Pizza Hut franchisee), he didn't realize he was raising his son John to follow in his footsteps. 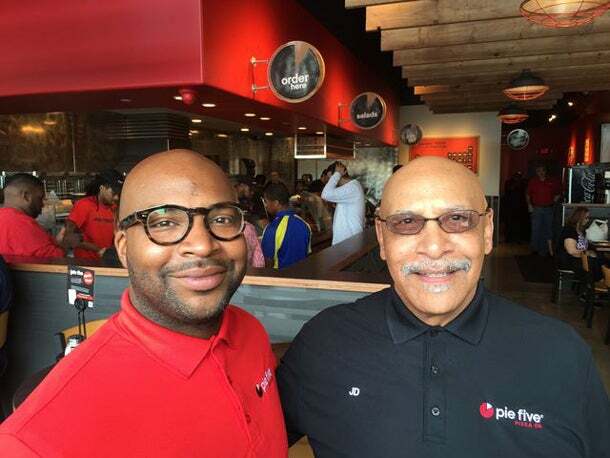 In 2015, the father-son duo decided to team up to take on a new concept: Pie Five Pizza. Together, they plan to open 55 locations of the fast-casual pizza chain. Here's what they've learned. JD: I started with Burger King right out of college in 1971. I eventually joined V&J Holding Company, a minority owned franchise group, where I worked my way up over the next two decades. John: It sometimes feels like I grew up doing this. As a kid I recall riding in the car with dad as he’d visit his restaurants, but I never saw myself following his path. I started my own restaurant career in 2005 and opened my first Wingstop in 2011. JD: Franchising offers the best of both worlds. You’re in business for yourself, but not by yourself. With the right partner you can run your restaurants, yet still get vital support from the company in areas such as operations, marketing, and training. While you still have the opportunity to advance, expand and control your own destiny, franchising takes some of the risks off the table because you’re partnering with a company that is invested in your business and offers high level support. John: For me, it’s an opportunity to move past established brands that are struggling to stay current and relevant. I want to bring fresh food and choice to the market. Investment in new brands like Pie Five that offer something new is what tomorrow is all about. Franchising really gives you the opportunity to direct your business based on today’s consumer. I look at my father’s franchise legacy and see his many successes, and I also know that the nature of this business allows me to write my own chapter of the story. JD: I started in the restaurant industry as a store manager making $1.75 an hour and worked my way up the ladder to district vice president for the Keys Group, the first minority group to own a national franchise. We were more than restaurant owners back then—we were a beacon of hope to minorities in Detroit, showing there were opportunities for them. Forty-some years later, I’m still looking for opportunities to contribute and bring jobs to my home, now with my son by my side. John: I actually studied business and out of college I was an accountant. I later followed my father and started working for V & J Holdings, but focused my work in development and real estate before moving on to franchising. It gave me a great foundation in parts of franchising people often take for granted. JD: I met Pie Five’s CEO Randy Gier when he was chief marketing officer for Pizza Hut and was impressed. He was very connected to what he was developing. Randy has always had his ear to the ground and understood the mind of a customer. At Pie Five, he’s launched an innovative concept that takes fast casual to another level with pizza customization and speed. John: I was looking at several brands, including some pizza concepts, before dad pointed me towards Pie Five. I flew to Dallas to look at Pie Five with no intentions to buy in. Seeing the concept in action changed my mind on the spot – the product is made fresh right there in front of you to your own specifications. It’s fast, fresh and allows the customer to enjoy their experience. I’m looking to the future and the change I see in consumer preferences and tastes. I felt Pie Five was that future and bought into the company feeling Pie Five Pizza is the right brand for the right time. JD: Pie Five has the right leadership and the team Randy created played a big part in our decision to go with Pie Five. Having leaders in place who know how to grow a brand and have worked with franchise partners in the past is key to success. The Pie Five team had all the right experience and a desire to engage in each franchisee relationship. You have to enjoy the company/franchisee relationship. John: Their model allows us to run our business and, as JD said, control our own destiny. There are no other franchisees in the area, competing for business. Many other franchises are grouped by co-ops, but each area is different. Pie Five treats each franchisee differently, based on their specific needs, so there are no missed opportunities. Without sharing exact numbers, I’d estimate that cost was between $400,000 to $500,000. JD: I do a lot of research online, looking at different concepts and finding the balance between a profitable and sustainable business and the need in the market. I talk to other franchisees and learn from their experiences. Of course, experience is everything. With Pie Five, I was specifically looking at pizza concepts. This area Michigan is the home to some great pizza concepts. But once I stepped into Pie Five, I was sold. John: I’ll add onto what JD stated in learning from your peers and listening to their experiences. But, also you have to listen to your inner voice. There’s a gut reaction that gives you your direction. This is what drives me. I know what my years of experience have taught me and I know what I want for my company and my community of customers. JD: One of the obstacles is understanding the vendor relationship. Sometimes you think you know what to expect, but end up being surprised. You learn to find quality concepts that allow you to run your business, but will also support you. Having clear expectations of that support is vital. That said, I would also say that you must plan for the unexpected and don’t anticipate perfection. Plan for what may go wrong, because it will. But you will learn from it and grow – especially if you have a great partner. John: I have a lot of experience working with real estate and leasing. I’ve seen a shift in the real estate market and how leases are signed and executed. Some markets are more mature than others and better suited for franchise real estate options. With more and more fast casual concepts and thinning economies come more challenges. JD: Do what you love to do, not what you think you have to do. Often we study and train and find in the end we’re not happy. If you do what fills you with pride and happiness, you will be successful. Franchising is inclusive of a number of interests and talents, but you must have a love for it. We’re in the hospitality business, which means we ALL need to be hospitable – that must be at the core of the person who wants to be the heart of the business. John: The options for development are changing the real estate landscape. You need to know your market, find the right location and bring a great brand to the community. There are also brands that won’t fit the market or location you are in. Knowing the difference is imperative. John: More Pie Five Pizzas, of course. We have a great relationship with Pie Five and are looking forward to building 50-plus units in Michigan and Wisconsin alone. We’re also eyeing Ohio as a possible new market. JD: Our goal has always been to be the best. So, I look at growing our business with smart brands like Pie Five and with talented people who share that vision to be the greatest operators, developers and creators of opportunity in the country.